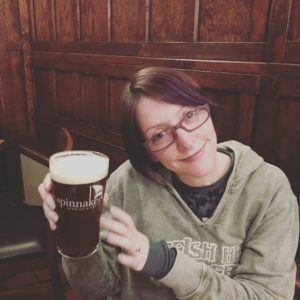 It’s that time of year again; time to comb through my Untappd history to see what I loved immediately, what grew on me, what I had second thoughts about, and what I’ll be leaving out entirely to keep things positive. 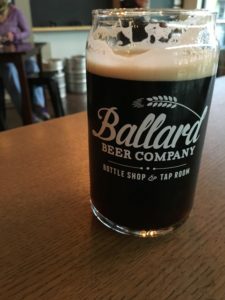 Although I frequently lament the preponderance of IPAs here in Seattle, there are quite a few on the list that stand out – equally, while there aren’t enough bitters, porters and stouts around these parts for my taste, those that did impress are highlighted. Travel, of course, influenced some choices as well, and I’ll wager that some of those I selected as especially interesting to the non-local are considered boring or ‘too accessible’ by some, but that’s what fresh eyes taste buds are for. We were fortunate to make it to ‘both’ Californias this year, as well as Portland, our old Philly-area stomping grounds, Vancouver and Victoria, BC, and London, though most of what features here is, indeed, local (for local people). We rarely go to official beer release events, because 1) it’s a pain with children and 2) crowd hassle in general, but this beer was well worth our trek over to Reuben’s Brews for the event. We love Reuben’s, one of our favorite local breweries (see the next entry), and were completely won over by Great Notion on our first visit to Portland (of which more below as well). Everything we’ve had from Astoria, OR-based Fort George has been top-notch, and this was no exception. Again, I may complain that it sometimes seems that everything in the area is an IPA somewhere north of 7%, but was simply wonderful. Reuben’s has been building out an ever-larger set of year-round beers, but their one-offs are always interesting. This particular one went well beyond that – my only complaint was that it was gone so soon. It had a lot of depth and complexity, and nailed a unique brand of ‘sour.’ I’m always a fan of reviving an underappreciated historic style, even if only in inspiration rather than specific recipe, so this ticked many boxes for me. Once again, it was hard to pick just one or two from Spinnakers, since everything – especially their cask bitter – was delightful, but this beer, brewed to give a nod to the firefighters who saved the brewpub during a devastating fire last year, was a subtle standout. Also of note: fantastic scones, most likely the best in North America. You can get decent beer at Disneyland! Well, more accurately, you can get not just decent, but really quite good beer, in California Adventure at the Karl Strauss beer stand. We were also pleasantly surprised by everything on offer in their brewpub in the otherwise-vaguely-dystopian mall next to Universal Studios (and after a day of shepherding children small and large around Universal Studios, drink is certainly called for), but these two beers were my favorites, and have become go-tos when trapped in California airports. Can you tell I love bitters? Yes, I complain they are hard to find here in Seattle, but Machine House makes some truly outstanding ones, as well as a great mild – they just don’t make it up toward my neighborhood very frequently, though I’m always pleased when they appear on cask as a guest at our nearby Elliott Bay Brewing outpost. And while this region does produce many great fresh hop beers in the fall, the Fresh Hop Talisman was my favorite. Again, rather lower-key and more subtle than many of the more heralded fresh hop beers, but really lovely. We made it back to Philly! Imperial Stouts are not usually my thing, but as always, Tired Hands excels where other breweries often seem a little ‘try-hard.’ It was also wonderful to have another HopHands – I miss being within walking distance of what is, for my money, the most interesting brewery in the US. Seapine is another local brewery that flies somewhat under the radar (at least in my part of the city), but I’ve really enjoyed most of their output, chiefly their pale ales and IPAs. But their seasonal stout was another standout for me; in a land where it’s hard to find a stout that’s not preceded by ‘imperial’ or ‘barrel-aged’ (again, all well and good from time to time, but not something I’m seeking out regularly), this was most welcome. More from our return trip to Pennsylvania, and we finally had a chance to see Victory’s new(ish) production brewery and taproom. The self-guided tour is very well-designed, and it’s fantastic to see how they’ve grown. While they do distribute here in the Pacific Northwest, I haven’t seen Home Grown here yet, but I hope it makes its way to this coast soon; it’s a really flavorful lager that’s neither too much nor too little. I miss Yards Brawler, my favorite US mild, and this makes a perfect lager analogue to a great ale. Hey, look – IPAs from Portland! Great Notion is one of those few breweries where we enjoyed absolutely everything (even some very fruity beers that I was highly dubious of before trying), but these were especially tasty. Juice Junior was everything you expect from a really great IPA, and Over-Ripe is the best New England IPA I’ve tried thus far; as much as some like to malign the style (often with good reason, given a few I’ve had that simply didn’t make the grade), this showed it can work very well indeed. Great Notion and Ex Novo are now our favorite Portland breweries. Ex Novo is somewhat similar to Tired Hands in terms of being able to do the weird stuff, and do it well, while also producing top-quality ‘normal’ beers. Cactus Wins the Lottery is a prickly pear Berliner Weisse, which may sound gimmicky at first, but it’s absolutely delicious; it’s rare for me to go back for ‘more of the same’ when I’m only on a flying visit, but this was a fabulous exception. The mild was also just as good, and in Portland, that’s saying something. It’s impossible to live in Seattle and not appreciate Cloudburst. Whenever I’ve been underwhelmed by yet another generic/too strong/wildly unbalanced IPA, they remind me that a really fantastic one can, indeed, be worth seeking out – and they are consistently creating those top-quality IPAs, like Talk and Not Talk. But they went off-piste with O Pioneers, which was a really lovely porter; proof that they really can do anything, and do it superbly. So, there you have it…we’ll be following up with thoughts on London in the near future…here’s to a better 2018. Victoria, BC, has a bit of a reputation for being ‘more English than England,’ and we put this notion to the test on our most recent trip across the border. It’s an easy journey from Seattle, even with a toddler who can ratchet up the degree of travel difficulty considerably, but the sensible people in charge of boarding the Victoria Clipper make sure that you can pre-board with your fussy, awakened-pre-dawn child. The trip is a relatively speedy 2.5 hours, and the quick check at immigration is one of the friendliest I’ve ever experienced – clearly, there’s something to the Canadian stereotype. There are no water taxis this time of year (though they do have a water taxi ballet in summer, which seems something we’ll need to investigate at some point), but even in less-than-ideal weather – this is the Pacific Northwest in late autumn, after all, so rain is a certainty – the walk around the harbo(u)r to our destination was pleasant. 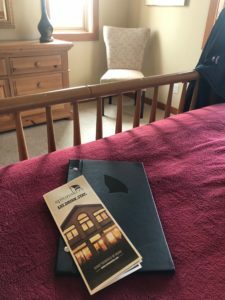 Having been deeply impressed by their beer and food on a previous visit, we opted to stay at Spinnakers, Victoria’s longest-serving (and, let’s be honest, best) brewpub, in business since 1984. 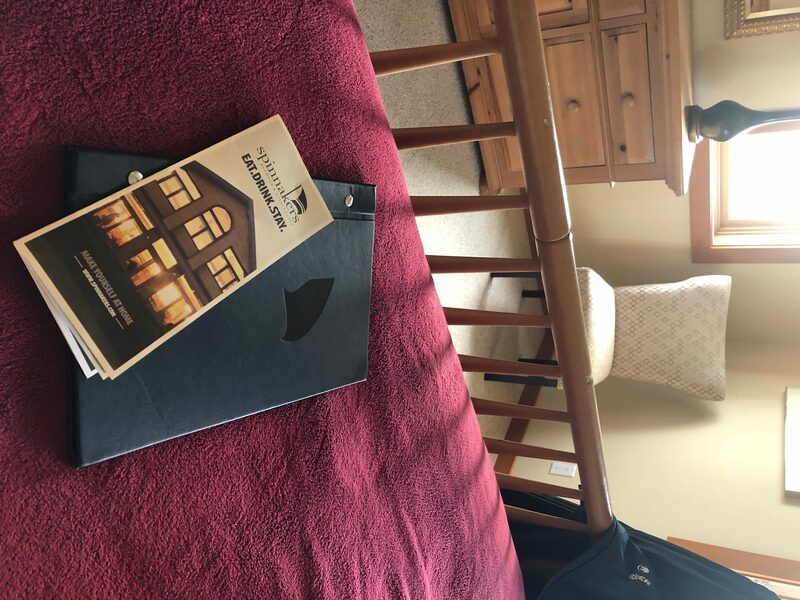 We were not disappointed by our room, which had ample space to allow our children to ignore us when they so desired, and breakfast is included as a perk of staying on-site. (In case you were wondering and/or feeling cynical, there’s no need for any sort of ‘full disclosure’ here – no freebies, just a great experience). And the breakfasts are amazing – fantastic scones, a variety of great entrees and a beautiful water view; it’s actually rather a good thing the water taxis weren’t running, because we needed the longer walk downtown to work off the generous portions of wonderful food. And, of course, there’s the beer. While everything was lovely, I especially enjoyed the cask bitter; our friendly, if bemused, waitress had to come ask me if I was really fondly stroking my pint. I had to explain that a great bitter is a rarity for me, so yes, it’s all true. Also of special note was the Firefighter Thirst Extinguisher Session Ale – we didn’t realize we had arrived on the anniversary of a large fire a year ago, but everything looked perfect – there was no sign of damage any more, and the ‘thank you’ beer was really quite wonderful. It could be argued that there isn’t the range of ‘adventurous’ beers we are used to on this side of the border, but I certainly did not feel their absence. We also did the usual tourist-y things – a tour of Parliament, a return visit to their excellent historical ghost walk (those not with the smaller member of the family also enjoyed the Chinatown history excursion), went to Munro’s to buy far too many books – and then we started on the tea. We didn’t make it to Murchie’s last time, but visited a few times on this trip; while I’m sure the fancy high tea at the Empress is lovely, it’s likely not geared toward a 3-year-old’s attention span, so we opted for basic tea and cakes. I’m not sure if it’s simply down to a sampling error, but on each visit it was full of transplanted Scots; it may be that Victoria is secretly more Scottish than Scotland, rather than more English than England. And a side note for people like me, who love good tea but can’t have too much caffeine: Murchie’s Decaf Afternoon Tea is actually good! Most decaf tea is, frankly, appalling, so this was a very welcome discovery, as was the fact that the local supermarkets stock most of the terrible British snacks and cereals I miss from living in Britain in the 1990s. Finally, a bit of an unexpected recommendation: we had another great meal and some fine beers at the Irish Times Pub. I quite wrongly assumed it would be like every ‘Irish’ pub in North America – Guinness and Stella on tap, and some microwaved shepherd’s pie – and while there was indeed Guinness, it was accompanied by simple, but well-prepared fresh food and a wide selection of local beers. I’m very tempted to go back again for their breakfast at some point in the future. We’ve already made a list of galleries we’d like to spend more time in on a return visit; there is a wide selection of works by local First Nations artists we didn’t have enough time to explore, we skipped over the major museums and gardens on this trip, and I didn’t even mention the range of shoe stores that stock shoes actually made for walking – another rarity around these parts. Victoria’s well-preserved (and thoughtfully re-used) older buildings are a draw, but even the new construction had me checking prices; I’d happily go back in any season. 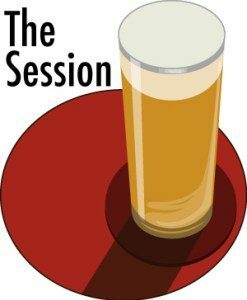 The Session 129: O Porter, Where Art Thou? But back to porters – I was quite envious of the recent wealth of porters around Britain mentioned by Boak and Bailey, and hope to find a good many of them still around when I’m next in London over the holidays, but I think a lot of my porter problem (kids, feel free to steal The Porter Problem for your new free-jazz combo) is the absence of Troegs Dead Reckoning Porter; to me, this is the beer that means fall has arrived. While I’d love a special coast-to-coast tap sending me Troegs (and, let’s be honest, Yards Brawler, my favorite US mild) from the source(s), I’d hoped that there would be a readily-available local equivalent; if there is, I have yet to find it. So, let this be a challenge to Seattle brewers – make your best porter! Try a few historical recipes! Feel free to make it hoppy if you must – hey, Troegs did it, and it’s wonderful. What Does a Beer Festival Look Like, Anyway? I’ve been overthinking beer festivals lately; mulling over the idea of developing a taxonomy of beer events, then abandoning the idea as Not Useful. But some questions stick in my mind: when is a beer festival a ‘festival’ and when is it an ‘event’ (in the ‘Facebook event’ sense)? Is something the scale of Philly Beer Week too big to be a festival? 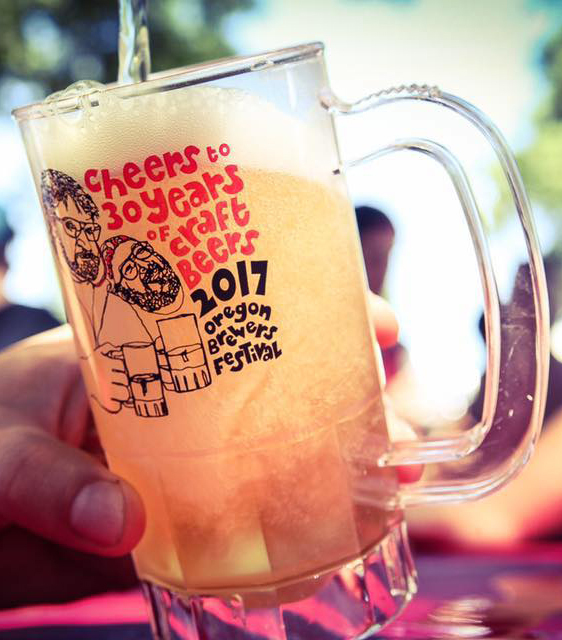 Is Seattle Beer Week’s Celebration of Women in Beer its own festival, nested within a larger one? Has something like GABF become too ‘corporate’ to be festive? Is our local progressive Oktoberfest* a festival? Or is the Cask Bitter Festival held by Machine House, one of my favorite local brewers, really too small to warrant the name? Can they ‘take over’ their own taps in a single-style tap takeover? I’d argue that their branding worked – there may have only been 4-5 beers featured in the ‘festival,’ but it certainly got me there. It’s odd to think that cask bitters are now so rare on the US beer nerd scene that they need to have a whole weekend dedicated to them; back when I began attending beer festivals in the late 1990s, bitters, brown ales and stouts were typical fare – now they are nearly as novel as this month’s most popular resurrected-and-tweaked forgotten sour historical style, and they are probably not considered as ‘accessible’ as everyone’s standard-offering 7% IPA. Indeed, most beer festivals I enjoy tend to be somewhat smaller in scale. I no doubt ‘imprinted’ to some extent on the first beer festival I attended more than once: namely, the Mountain View Small Brewers Festival. Back in the late 1990s/early 2000s, in the heady days of the dot-com boom and bust in Silicon Valley, this pleasant annual event was largely a Local Festival for Local People. As I lived a short walk away in a terrible, expensive 1-bed apartment (and this was in a pre-Google Mountain View), it was doubly so for me. It was my first introduction to beers from Firestone Walker, Mendocino Brewing and Widmer Bros, long before they were even regional powerhouses, but I had a special fondness for Wizard Brewing, whose hand-carved, Tolkienesque tap handles were a crowd-pleaser to their nerd-dominated audience; we were people who knew our way around a D20 (though some of us were beard-free). The beers tended to be British-influenced, and anything ‘sour’ or ‘wild’ was almost certainly not so purposefully crafted, and such terms were entirely absent. Rogue and Sierra Nevada brought their IPAs, but they were something of an exception; especially bitter and/or hoppy beers were practically confrontational (at least according to Rogue’s/Stone’s marketing materials). But Michael Jackson himself recommended the festival every year, so it had to be good. Festivals – at least, festivals I attended – began to get bigger, more expensive and slightly weirder in the early-to-mid 2000s; the event that evolved from The Book at the Cook at the UPenn Museum in Philadelphia became the Annual Michael Jackson Beer Tasting, with beers from Dogfish Head, Yards, Troegs and Victory (plus some international oddities), and the man himself in person. He was incredibly generous about signing books for tipsy, effusive fans (ahem), and happy to talk tasting notes and the history of the local and international scene. It was a unique chance to sample some of Dogfish Head’s Ancient Ales before they were commercially available (though we got to do this at the brewpub in Rehoboth Beach not infrequently as well), and I’ve never been to a more wonderfully-appointed salon for a festival – being surrounded by ancient Chinese and Egyptian art is a far cry from tents in a field or booths in a convention center under flickering lights, though I cannot imagine the museum’s insurers signing off on it now. This and similar local festivals seemed to be a chance for brewers to showcase their standard lineup – maybe bring a small keg of a one-off beer, or a special collaboration with another brewer at the festival, but in most cases, that was the exception; it seems quite the opposite now, when brewers seem to compete to bring their most oddball beer to each festival. This is no doubt driven by drinkers, at least those polled during market research, who claim to seek novelty, and while novelty itself is no bad thing, it can become repetitive in its own way. Gilbert & Sullivan wrote, ‘when everyone is somebody, then no-one’s anybody,’ and that rings true at some festivals now. If everyone has brought their ‘tequila-barrel aged Mexican lager brewed with lime,’ it’s easy to skip those booths, but it can’t be cheap for the brewers to continually churn out specialty beers for the huge number of festivals that now appear on the calendar. I had a candid chat with some of the higher-ups at Victory Brewing a few years ago – I was interviewing for a job I didn’t get, though they were lovely about the whole process – and they were quite open about how Philly Beer Week was tough for their staff: locals wanted to see something special or otherwise hard-to-find, while those who were visiting for the express purpose of trying all the local beers wanted a mix of the standard line-up and a few of those ‘white whales.’ Getting that festival lineup wrong would be expensive for a larger, established brewery, but potentially ruinous for a smaller one. However, given that these are businesses, one assumes that there’s a strategy involved with going to (or not) individual festivals, whether those are local or far-flung – if the intent is to keep it small and impress your existing base, make a weird one-off; if you are working toward your regional, national or even global reputation, bring a well-made flagship beer – it’s entirely possible that your amazing mild or schwarzbier will seem exotic among the fruit-infused, barrel-aged novelty beers. There’s probably a very dry business school case study in here somewhere, but I digress. So, what do I really want from festivals now? I cannot speak highly enough of the recent Oregon Brewers Festival, which celebrated its 30th year when we attended this past summer; as a multi-day festival with no admission fee, family-friendly options for the kids and in easy walking distance of our Portland hotel (not to mention many of Portland’s justifiably-lauded breweries), it was absolutely ideal, if still beardy. There wasn’t the (usually self-induced) pressure of needing to try all ALL THE THINGS in the 2-3 hours of a pricey, one-day festival; it was pleasant to wander in, try 2-3 samples, then wander back out to see other sights. Having been to another ‘kid-friendly’ beer festival that was simply more trouble than it was worth (few activities, not enough food, hard to get to, questionable beer quality, etc. ), I had relatively low expectations, but Portland has it figured out. I do still enjoy many of the adults-only events, but they need to have a very specific focus and/or attendees to get me to shell out my babysitting dollars. And I would be remiss if I did not mention a ‘beer festival’ I came across when we were in the UK a few years ago; it was simply a series of rotating casks from a handful of specially-chosen breweries, highlighting the seasons – more or less just the normal offerings for this particular free house. No lines, no hype, no tickets, no tokens – just a beer you might not normally have, available with or without excellent food. The novelty factor was still there in that the beers were only available in limited quantities, but they were simply (mostly) excellent pale ales, bitters and stouts – old school. It would be too low-key to be considered a ‘festival’ by most American standards, but if this is the future of festivals, I, for one, welcome our laid-back, throwback beer overlords. *For those whose reading of the world ‘progressive’ now defaults to the political, thanks to The Current State of the World, this is a literally progressive Oktoberfest – it moves from brewery to brewery over the course of the afternoon, accompanied by an oompah band. Specialty merchandise – t-shirts, hats, drinking boots – are part of the fun. Protip: beat the crowds by always staying one stop ahead! What does a vintage candy commercial have to do with tech employment? Plenty. A recent Forbes article described the hot new trend of tech companies hiring newly-minted holders of liberal arts degrees. In my 20+ years of experience, this is neither new nor hot – I’ve worked on amazing dev teams full of people with multiple advanced degrees in the humanities who felt like earning an actual salary – but it’s worth talking about. While it’s absolutely true that there is a vast shortage of people with STEM skills in the US, and plenty of well-paying jobs sitting vacant for them at tech companies large and small, the notion that you ‘need’ a STEM degree to land one of these jobs is damaging, both to jobseekers and to companies. At the same time, there is an extremely tired idea that studying the arts or humanities is a waste of time, because it doesn’t ‘prepare you for the workforce’ – and that’s simply untrue as well. Both sets of skills are necessary in the modern workplace – and getting beyond that initial entry-level engineering job may be easier for those with liberal arts background, as we’ll discuss in a moment. And this is the point that is often misunderstood: you can absolutely succeed in a technical role with a humanities or liberal arts background, as long as you’ve also got the technical chops, and even if you are in a purely non-technical role, remaining ‘in awe’ of your technical colleagues isn’t particularly helpful – you should have at least some understanding of what goes into what they do, and know that it’s hard work, not magic. Many new non-engineering graduates gained solid technical skills as they studied Proust or philosophy (which does, to be fair, get a mention in the article), but it’s not always a given. 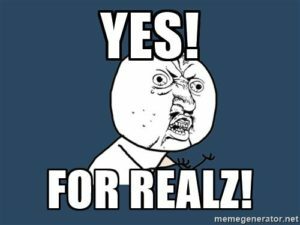 On the flip side, moving into a management or leadership role with a purely technical background is a different sort of challenge. For those looking to brush up on their technical skills, there is a burgeoning industry of boot camps and self-directed learning. If you’re an engineer who needs to learn to write, present and influence decision-makers in a new role, the path forward is rather murkier, even if someone is on a strict principal-engineer path. Good code isn’t enough to get you there, and some of the more theoretical aspects of an engineering degree program (which in itself is not exactly ‘vocational’ education, though that’s something that could be much more highly-valued in tech) are fabulous in helping you develop ways to approach a technical problem; being able to lead a team and explain to your leadership why you’ve chosen a particular path forward isn’t as straightforward. People with balanced strengths in social and math skills earn about 10% more than their counterparts who are strong in only one area. In fact, socially inept math whizzes fare no better than go-getters who struggle with numbers. While I’d be more than happy to introduce you to some equally-introverted historians (they’d totally hate that, of course), there is a useful point buried here: a basic understanding of both technology and the liberal arts gives you adaptability; fluency in both can give you career superpowers. Understanding how to wrangle data is important. Being able to contextualize and tell a story with that data, to multiple audiences, is equally critical. And having the ability to pivot to an entirely new role, vertical or industry is more realistic if you simply have more tools in your toolbox; being able to switch back and forth between technical and non-technical positions as business or life conditions change gives you options you might not have otherwise. This is not to say that specialization is a bad thing, or that all engineers are lacking writing and management skills – far from it. But developing expertise in one or more areas is what happens on the job, as you gain more experience, and technical degrees become ‘stale’ far more quickly than those in the humanities: a programming language you spent several months, or even perhaps a few years, learning as an undergraduate is most likely almost useless ten years down the line – if you’re still in the field, you’ve learned new languages and skills through work. But the ability to research, synthesize and present arguments, whether those are about the Corn Laws or stylistic pottery variations at Mohenjo-Daro, are still valuable skills when differently employed. The subject may be far removed, but the skills around critical thinking, thoughtful skepticism and time management are vital. And arts/humanities graduates have another leg up when it comes to tech job descriptions: ‘comfort with ambiguity.’ You’ll see a similar phrase in nearly every job description from a tech company, in both tech and non-tech roles, and yes, it’s an extremely useful quality to have in this (and many other) fields. Fortunately, if you’ve spent several years gathering data, writing research papers and debating complex issues that don’t have a clearly-identified ‘solution,’ congratulations – you’ve got the right mental training for this career. I’ve seen some young engineers struggle with just this aspect of the field – you can’t always engineer your way out of the problem (well, often you can build something, but it leaves significant technical debt that you – or someone else – will need to deal with eventually), and there may be multiple paths forward. Having experience of referring to historical precedent goes a long way. In my own tech career, I’ve never had to reproduce any of my shaky college algebra (turns out it wasn’t even useful early on as a front-end and back-end web engineer), but I write research papers, give presentations and analyze strategies and processes; these are things I was quite well-prepared to do as both and undergraduate and graduate student of archaeology – and that’s especially true for the data analysis skills I learned there, though the technologies and techniques are now quite different. So, where do we go from here? I was fortunate to be in the right place at the right time as a self-taught techie; early on in the dot-com era, the skills were the important thing; it didn’t matter where you’d acquired them. To a certain extent that’s becoming true again – boot camps and coding challenges are offering other paths in to the profession. But there’s a fundamental disconnect in the way we approach teaching both technology and the humanities, at least at the high school and college levels (there seems to be a little more room to experiment in the elementary years, though that seems largely driven by the STEM-only crowd). A newly-minted engineer, either at the undergraduate or graduate level, needs coursework and experience writing. New English or Art History grads may have had some exposure to technology through text mining or other digital humanities projects, but ensuring a solid exposure to ‘real’ coding is just as important for them. Internships would also ideally include both coding and writing experience – and many more are starting to do just that. We also need to do a better job as a profession helping people from purely technical backgrounds move into senior roles – a few hours of ‘management’ or ‘business writing’ training isn’t especially impactful in most cases, and there aren’t equivalent writing ‘boot camps’ to help hone those skills. Having a foundation as a matter of course, even if it wasn’t the key focus of a degree program, would go a long way toward setting people up for success – testing out of English 101 isn’t the same thing. While many larger tech companies have figured out that an ever-broader population has tech skills as well as what we might term ‘business’ advantages, startups and smaller companies aren’t always aware that they should cast a wider net in tech recruitment. Librarians have often been forced to become software development managers, just by the nature of modern work in the field. PhD historians often outpace new data science grads – many of those skills are part and parcel of modern academia, they just pay very poorly in that setting. There is an artificial barrier between these two broad skillsets that needs to disappear; having a foundation in both is critical for success in tech, and in many other businesses. Putting the two together brings out the best of both, just like the commercials said. This post also appears on Medium.com. I recently had the good fortune to geek out on corporate culture with the wonderful people of Zappos (full disclosure, we are ‘cousins’ within the Amazon ecosystem, though I include my usual ‘Not Speaking for AWS’ disclaimer here), and while they had a full spectrum of fascinating, positive things about their culture to latch onto, what I was most struck by was the role that shared experiences played in shaping their unique approach to work, and how the thoughtful, intentional creation of shared workplace experiences is often overlooked as a tool to drive a positive corporate culture. I am certainly not unique in having worked for a variety of companies, large and small, that miss the mark when it comes to helping you learn how to navigate and thrive in their specific cultures. Back in Silicon Valley during the dot-com boom and bust, I experienced both little startups – I was employee 18 (or so) at a dot-com, pre crash/burn – and I subsequently worked for a few huge, global tech companies. While those organizations were very different from each other in almost every way, they did share a total lack of structure around onboarding. That’s expected (though not really excusable) at a startup, but even at Big Tech Company No. 2, no one helped me figure out how to get paid until about 3 months in. There was no training, either formally or informally, on in-house tools, norms or expectations. I don’t think I saw a company mission statement or had a specific new hire or role-based orientation program until about a decade into my career. And then I have experienced the other side of that coin – training and process overkill. Another nameless company I worked for was insistent about transmitting everything to do with its goals, values, compliance, and culture via time-consuming, mandatory e-learning. While there is certainly a time and place for asynchronous training, especially when you have a global workforce, I argue that if you are looking to foster long-term business relationships and a strong, healthy company culture, e-learning and classroom training aren’t magic bullets. Live, shared experiences are the key, and that brings me back to Zappos. Everyone who joins Zappos, regardless of role or level, joins a cohort of new hires who have four weeks of training – they learn the customer service role inside and out, they work the phones and speak directly to customers in the call center; no one gets to opt out to attend a ‘more important’ meeting. Their training is capped off by a real-life graduation ceremony, and many of the people I met, in a variety of roles, fondly recalled their training; it gave them a firm grounding not just in the company culture and expectations, and also set them up for success at building relationships across departments and roles. I’m sure those relationships are a major factor in why there were so many long-term Zapponians – people whose tenure often exceeded a decade. From a tech perspective (including my own, which, again, is not unique, where I’ve seldom been in any one company more than 2-3 years), that’s astounding. This is not to suggest that every company should go out and bolt on a four-week immersion experience to their hiring process; it’s certainly not cheap and for a globally-dispersed team, small or large, it’s simply not always feasible or even desirable. But even fully-remote companies realize that technology alone can’t create and develop culture; Automattic’s approach of an annual meetup for the full company and smaller team get-togethers creates regular opportunities for their employees to share experiences. Other companies have town halls or all hands meetings that serve similar functions; the cyclical, almost ritual repetition of these kinds of meetings (and, not infrequently, the trip to the libation chamber bar after) lets employees build organic relationships and memories – ‘remember the all-hands where X spoke or Y performed?’ That’s important. Shared experiences drive shared purpose. 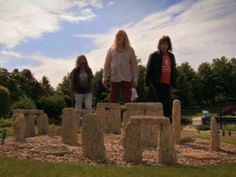 As humans, we seek out cyclical, seemingly ritual, experiences – is an annual trip to Disneyland substantially different from a theoretical ‘pilgrimage’ to Avebury or Stonehenge undertaken by their builders (and, quite probably, their plus-ones)? We have good evidence that the ‘users’ of Stonehenge (to put it in vaguely techie terms) liked a good annual party; the motivations behind it may have not been terribly different than that of a modern company picnic or offsite: do something different from your regular workday, with your colleagues (and possibly your family as well), then consume food and beverages. There would have been other commonalities with our era – everyone would recall the colleague who got horribly drunk one summer, or the time someone’s dog tried to attack the fire-eater (you may recognize the voice of experience here). While the terms we use to talk about prehistoric gatherings tend toward the mystical or mysterious, that’s largely a function of the paucity of evidence and/or our tendency to want to make something we don’t immediately understand more meaningful, but annual or seasonally-occurring events in the distant past may have been quite similar to ours – a working meeting with a party afterward. 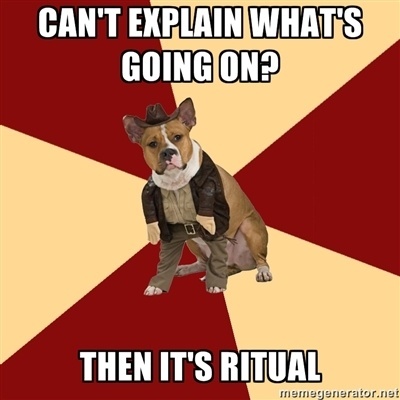 In the workplace, we create rituals whether we mean to do so or not. A standing happy hour, a semi-organized run at lunch, a yearly offsite or even our more formal business mechanisms like annual reviews or daily standups drive our culture. How we create and evolve those experiences for employees says a lot about that culture – going back to Zappos, they ensure that everyone has the opportunity to attend their all hands meeting; it’s such a priority that the call center is shut down for the occasion, as it is – briefly – for some other seasonal events. Creating an environment in which all employees have consistent, shared experiences builds personal connections and deeper engagement – provided those are good experiences. Yes, it’s hard to do globally, at scale, but it’s worth trying. Be intentional. What do you want to create, and why? How will you evolve it? Be consistent. Create a regular cadence and stick to it. Be inclusive. If your site or event doesn’t welcome everyone (and there may well be certain team- or role-specific events), what are you telling current and prospective employees? Have fun. You may not see a direct ROI on every event, but if your employees want to be there for the long term, you’re doing something right by giving them something to remember that that isn’t just their meeting schedule. Finally, think long term. Everything you do is adding to your company’s history, whether that will eventually be long or short – what kind of story do you want your employees to tell their future grandchildren or robot overlords? Well, we did it – after over a year and a half of living in Seattle, we finally made it to Portland. I admit I had lowered my expectations somewhat – could the beer really be that good? As an old, jaded beer nerd (not to mention one who has been thoroughly spoiled by having lived within walking distance of Tired Hands), I’m used to finding things that I’ve heard mentioned in either hushed reverence or wild enthusiasm to actually fit somewhere between ‘it’s not bad’ and ‘did we really need another 12% barrel aged sour?’ Or worse – ‘does it have a high BeerAdvocate and/or Untappd rating simply because it’s so alcoholic/hoppy/sour/hard to find as to be nearly undrinkable?’ And the much-maligned Portlandia-is-real hipster food scene – surely it would be quite similar: lots of dishes that were perfectly nice, but probably little worth braving Amtrak for (or – spoiler alert – your replacement bus that is required when Amtrak is sidelined by a landslide). After all, Portland is much smaller than Seattle, and I’ve found Seattle’s food and beer to be pleasant, though not nearly as good as what we had in Philly, and certainly nothing like our old Brooklyn stomping grounds, though that’s always an unfair comparison. Something billing itself as ‘the nation’s first nonprofit brewery’ sounds like a Portland cliché, right? But absolutely everything about it – the welcome, the food, the beer, the fact that they donate their net profits to the local community and beyond – was fabulous. It was outstanding across the board: the kids had milkshakes of a quality I’ve not had in years (so good it stopped a travel-induced tantrum), I had possibly the best taco I’ve ever eaten, and we got bacon for the table. 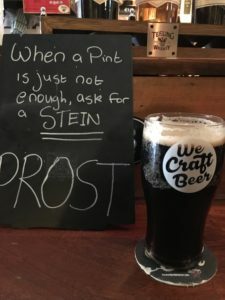 The beers were uniformly fantastic, from Cactus Wins the Lottery, a Berliner Weisse made with prickly pear cactus, to Where the Mild Things Are, a great – you guessed it – mild. I loved this place so much I started looking at local real estate prices. This was on my ‘try if in the neighborhood’ list, rather than a must-do, but it was so good I had the ‘what are the local house prices’ reaction again. 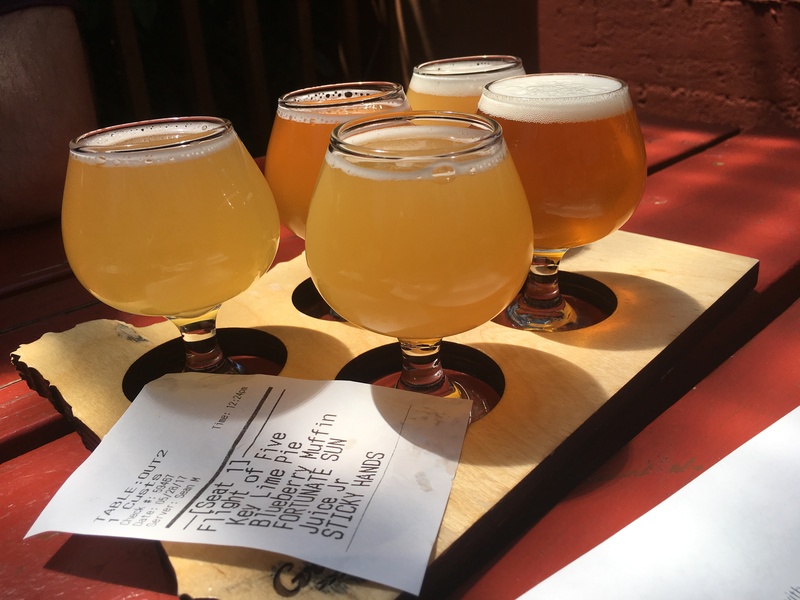 I admit I was a bit skeptical after my first glance at the menu; quite a few sour beers, and I’ve had so many mediocre sour beers of late – some clearly accidental, some just not nearly as good as their makers suggested. But thoughts of bad beer were banished quickly – the Key Lime Pie and Blueberry Muffin beers were both wonderful; tart and refreshing, nice fruit character, but never cloying or perfume-y as is so often the case. Juice, Jr. was a fabulous IPA and as with Ex Novo (with whom they also collaborated on Best Budz – not a hipster pot beer, as you might fear, but a successful New England-style IPA, as we are calling them now), the food and service were both great. There was a welcome toy box and even the children’s menu was made with top-quality ingredients; I would be tempted to order off that menu for myself. Deschutes has always reminded me of Victory, our previous local stalwart when we lived in Pennsylvania – they’ve been around much longer than most of the smaller (and often weirder, in both good and bad ways) breweries, and to some they sit in that awkward ‘uncool’ space between the upstarts and the mega-brewers, but both have continued to thrive by offering a consistently high-quality product line, as well as careful expansion and innovation. Their Portland brewpub offered a good range of interesting food and tasting flights that backed up their reputation. Everything was lovely, but the Altbierior Motive stood out as a new-to-me offering. I’m not generally a huge ice cream fan, but it would have been churlish to go to Portland and not at least try Salt & Straw, even though it seems their frozen empire is slowing moving up and down this coast, and it was well worth the trip. We actually skipped the tasting flight simply because the line was long and this time the tween, rather than the toddler, was fussy, but we did swap around a few times to good effect. We returned to tasting flights when visiting the fine local distilleries, but my favorite non-beer sampling session came at Steven Smith Teamaker. 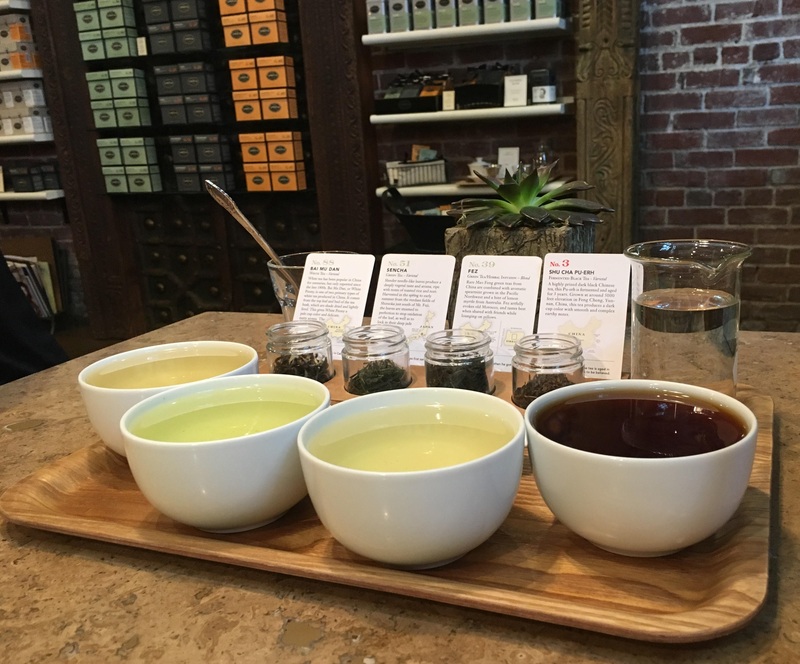 Both of their locations are in nicely-restored buildings, and we very much enjoyed the beautifully-presented custom tasting flights, each complete with a card detailing the tea’s origin and properties. We went home with a lot of tea. Putting aside a few minor quibbles – one much-talked-of brewery that had excellent food but only ‘meh’ beers, a ghost/history tour of highly questionable historicity (not to mention the poorly-constructed ghost stories – there are formulas for this, people!) – Portland also impressed with its largely-thoughtful historic reuse. For a relatively young city by global standards, there is a large collection of older buildings and walkable neighborhoods that sit comfortably next to their new additions, providing a lot more character and visual interest than you get in much of Seattle. And, of course, there was Powell’s Books – that certainly lived up to and exceeded expectations. My major disappointment in visiting Vancouver was the absence of a great independent bookstore (though, to be fair, the ghost tour was pretty good – yes, I judge cities by their bookstores and ghost tours), so Powell’s, with their detailed categorization and (actual) curation, makes Portland a much more attractive destination for us bookish types; the transit and odd specialty shoe stores were also very much to my specifically-weird liking. In short, we can’t wait to go back – if someone could send a beer and taco truck from Portland to Seattle in the meantime, I’d be most grateful. It’s been difficult to miss stories of tech and startup culture fails of late, whether it’s Uber or Thinx, and there have been many excellent suggestions on how to improve diversity and the employee experience, but I’ll throw another one into the mix: hire an archaeologist*. I fell into technology while working on my MA in archaeology at University College London in the 1990s; I began my tech career as a coder and moved (kinda/sorta) swiftly into people and technology management in Silicon Valley, NYC and elsewhere – I’m now happily situated in Seattle, where I get to do all sorts of Secret Things I Can’t Tell You About Right Now. Along the way, I’ve seen some pretty bizarre things from a company culture perspective (terrible brand rallies! awful ‘culture fit’ excuses in hiring! team and product names that are totally offensive to colleagues in other regions! ), but I’ve also been lucky enough to see the good as well. After a few general culture protips, we’ll discuss how having an archaeological viewpoint can be a huge benefit – for real. First, though, a few notes on What You Should Do; your company culture, like any other aspect of business, can’t be left to good intentions – it needs structure and mechanisms to reinforce it and to help it evolve in a positive direction. Whether you are a tiny startup or a huge multinational, you need mechanisms that will scale with your organization’s growth, and that can be consistently applied wherever your people are. You may need to modify them to work in some regions or for remote people or teams, but they should still be scalable and repeatable. If your company’s mechanisms for people management don’t reflect whatever your company’s stated values are – or if they overindex on a specific one or two points – you’ll very quickly get drift away from the good intentions that went into their creation. Having repeatable, measurable processes around your business life cycle and the people who make it happen is the key to a healthy culture, and this is where the archaeologists come in. The popular view of archaeologists falls into one of two main camps: we’re either Indiana Jones or scruffy bearded people with a fondness for drink who wish they looked a bit more like Indiana Jones. I surely don’t need to point out that both of those impressions skew almost entirely male (feel free to insert a Tolkien joke about dwarf wives and their beards), but there’s a lot more going on than just drinking digging and/or punching Nazis. While I won’t get too deeply into describing different approaches to archaeology (for example, did you know that theoretical archaeologists mainly argue about French social theory, and rarely, if ever, go outside, much less dig? Did you know that post-processual archaeology is real? Mostly true facts! ), there are some commonalities that give archaeologists an edge in mapping and shaping company culture. Everyone ‘knows’ that archaeologists can take an artifact (or, more typically, an assemblage of artifacts) and use clues from that artifact to tell us more about the people who created it, traded it, used it or who perhaps just thought it looked cool. At work, we create ‘artifacts’ every day without thinking twice about it – documents, wikis, websites, apps, you name it. And when we’re speaking about those internally-created artifacts that are used to hire and manage people – interview notes, performance reviews, presentations and so on – it’s easy to forget that the mechanisms that generated those artifacts were designed with specific long- or short-term goals in mind. Indeed, there may have been considerable ‘cultural drift’ between a mechanism’s original purpose and its current usage; for example, it may have once been the case that ‘big ideas’ went through a presentation-heavy gating process to get executive buy-in, but now it seems that absolutely every decision goes through some version of that. That’s not to say that processes and mechanisms like that can’t work, but that the rationale behind them needs to be understood, and that they need to be regularly reviewed to ensure they are still fit for purpose. Not infrequently, most employees who need to actually follow these processes have little-to-no information about why it was created, or what the unwritten rules are – it’s purely tribal knowledge. And that’s another way archaeologists ‘get’ how to dig (har) into corporate culture: when they don’t know why something was created or can’t pin down an obvious purpose, there’s a default answer – ritual! (In all seriousness, this is a thing. It’s practically reflexive). But so much of what happens day-to-day at work falls into this bucket as well; as mentioned, the people who designed (or inherited) a process have left, or have long since forgotten its origin, and it has become almost entirely ritualistic – we do it ‘just because.’ Sure, we’d like to fix that broken process or mechanism, but it’s like that For A Reason, we assume – and thus are corporate sacred cows born. This is just as true looking at archaeological sites; while some pretty weird things do, indeed, fall under the ‘ritual’ heading (at least without further evidence), it’s also clear that people in the past not infrequently did things just because they were fun or looked cool – they aren’t so different from us. Throwing an archaeologist at your company processes and mechanisms can turn up all sorts of unexpected things about your company’s culture; simply having a complete audit of all the ‘things’ you’re doing, how they came about, whom they affect, how and where they are implemented is quite illuminating. Turning an archaeological lens on this adds further value; as mentioned above, people rarely know precisely why they created something or how it evolved, so having a background in making educated guesses in that regard, based on data, is quite useful. With this information in hand, you can begin to make better data-driven decisions that drive your company culture – did you discover a gap in your onboarding process in a specific region? Perhaps there is no policy to handle difficult employee situations, or you may simply have not had time to develop a codified, shared value system for your organization. Knowing where you have a potential problem and what resources you need to allocate is job one – you can thank an archaeologist when they help you unearth these clues. Finally, a closing thought for the archaeologists out there: want to come work in tech? You have great skills in data analysis, project management, research and writing (to name just a few), and many of you have excellent coding skills – while we don’t get to spend much time studying the past over here, we have the opportunity to help our organizations be thoughtful about how we build the future. Bonuses: excellent pay and benefits (actual excellent pay and benefits, not what most rescue digs or academia can afford), opportunities to work remotely and/or travel, and a work culture that still enjoys a drink or three – though that’s not certainly a requirement. Beards are entirely optional. *Other types of social scientists are also available, but I don’t know if they are as much fun. I have long had a fondness for ‘brown’ beers of many descriptions: dark milds, schwarzbiers, porters, dunkels, and, of course, your better-than-average brown ale (either theoretically British or American – I know I should like a good Oud Bruin, but it’s just not my thing in quantity). And, once upon a time, brown ales loomed large on the beer horizon. Newcastle Brown Ale was widely available, and Pete’s Wicked Ale was the go-to American version of the style. Cast your mind back to a differently-benighted America in the early 1990s…while there were a few interesting regional beers, nationally-available ‘microbrews’ (as we used to call them) were few and far between. If you weren’t a lager fan – and you might have over-corrected in your dislike of the macro-brewed ‘lager’ offerings to ignore Sam Adams – your options were relatively limited. Your ‘import’ choices tended to be pretty straightforward British beers: Newcastle Brown, Samuel Smith’s Oatmeal Stout and the like. 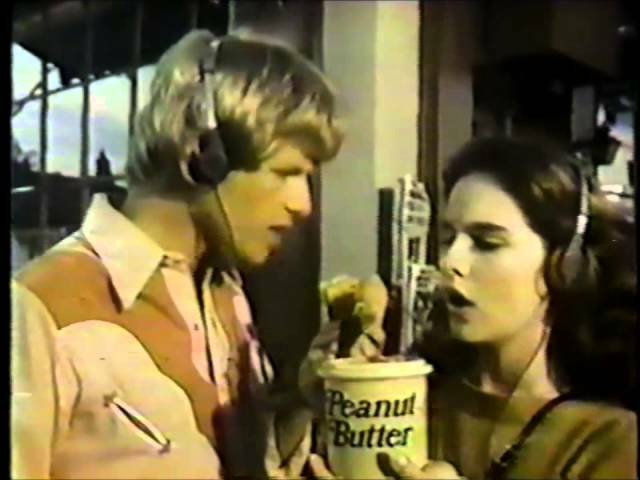 These were presumed (at least by me, in my inexperience) to be vastly superior offerings – they had color! Flavor! Exciting times. Moving to the UK in the mid-’90s quickly taught me that while there were certainly good things about British music and television, there was just as much that was terrible as there was in the US; it was just that the worst (and some of the best) never made it abroad. This rule applied equally to beer – I discovered that ‘the good stuff’ was often simply from a local family brewery, and they didn’t always make enough to export. But I loved my go-to beers, even if they weren’t ‘fancy’ – a pint of Theakston’s Best, Brains Dark, Moorehouses’s Black Cat, Lancaster Bomber (the version from the 1990s, not the current iteration, which seems much changed). I tended to go for beers on a chestnut-to-dark-brown continuum, and while I do go for more variety today, overall, that pattern still seems to hold. Even back in the US in the dead-end of the millennium, the Mountain View Small Brewers’ Fest featured a wide variety of copper-to-black beers of varying quality, not infrequently named after less-renowned Tolkien characters, though this is to be expected when software engineers have side projects. Shortly thereafter, the American beer scene exploded – microbrews became ‘craft beer’ and bitters, stouts and porters began to play second fiddle (or perhaps eighth oboe) to IPAs. ‘Boring’ brown beers began to disappear – milk stouts were booted for coffee stouts, and everything else on the amber-to-brown spectrum seemed to end up aging in or on oak. Fortunately, though, the pendulum for extremes seems to have shifted slightly – sure, it’s nice to have some of the more extreme stuff from time to time, but on the whole, it’s lovely to have beer that tastes like beer. Of late, there are few things I enjoy more than a toasty, biscuity ESB or a roasty – but not too roasty – mild, but they are relatively few and far between in the Pacific Northwest; granted, we have great IPAs, but the ubiquity of great IPAs also means we are awash in mediocre ones, since nearly everyone feels they need to make one to compete for tap space, even if they aren’t particularly successful at it (and they are probably correct). There are a few local standouts that do fit the bill for this discussion, however – Lower Case Brewing’s ESB is very fine indeed, and I recently had an excellent, straight-up brown ale called Betsy’s Mountain Brown at Naked City Brewery a few neighborhoods over from ours. 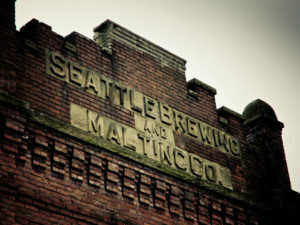 Perhaps because they grew out of the 1990s microbrew tradition that was more influenced by British pubs than (often wonderful) Belgian oddities, Seattle’s brewpubs tend to have a much wider variety of the sort of solidly-made, eminently quaffable ESBs, porters and stouts than many of the more buzzed-about small breweries – or maybe they simply assume a fairly large percentage of their clientele will be there for a meal with the family, and a tap list of 12% tequila-barrel-aged strong ales doesn’t suit all palates or occasions. So, with little fanfare, many are consistently turning out great coppery altbiers, dark caramel ESBs, deep ruby-brown porters and nearly-burnt-toast dunkels. Long may they continue – and here’s hoping more of the ‘edgy’ breweries also opt to show off their skills with a few subtle brown beers. And thanks to Joe Tindall for hosting The Session this month; I’ll be raising a glass of something coppery to you for prompting me to get back to regular-ish beer writing.